Keeping up with the Kardashians’ real estate dealings is always a veritable thrill ride, but if you want to stay one step ahead in the game, keep your eye on the properties for sale in the vicinity of momager extraordinaire Kris Jenner. The latest example of tightening those family ties comes in posh La Quinta, CA, located in the Palm Springs/Coachella area, where TMZ reports that Kim Kardashian West and husband Kanye West may be negotiating hard to purchase the $6.25 million mansion right next door to the one Jenner already owns. Whether the idea of living next door to mom sounds lovely or way too close for comfort, let’s just say it’s by no means unusual for the Kardashian clan. 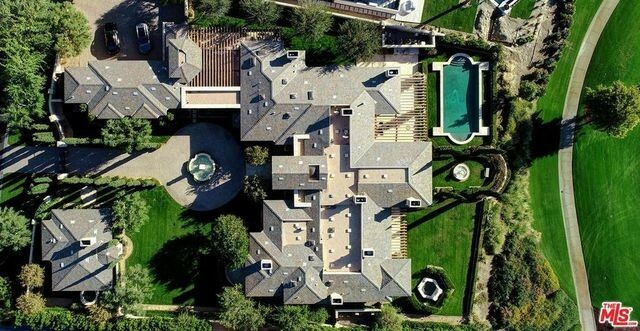 After all, Jenner, Kardashian West, and little sister Kylie Jenner have all purchased several homes within cup-of-sugar-borrowing distance from one another in Calabasas, an upscale gated community of Hidden Hills. Plus, since Kimye have three young kids and a fourth on the way, living right next door to grandma is a baby-sitting bonanza! Is this Kimye’s latest home purchase? 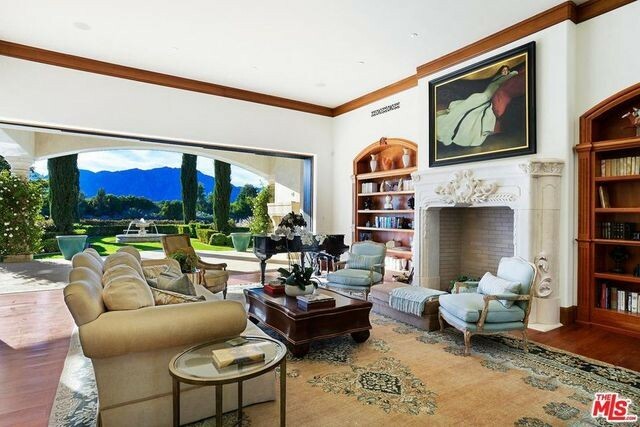 Jenner had purchased her own swanky spread, once owned by Sylvester Stallone, in August 2018 for an eye-watering $12 million. It’s a stunning single-story modern with seven bedrooms, eight baths, and two half-baths in 11,081 square feet of living space. You’d think that would be plenty of room for the Kimye entourage to stay with Mom on the occasional weekend and during the famed Coachella Valley Music and Arts Festival, happening at the nearby Empire Polo Club. But no. Apparently, the A-List couple prefer their own space, albeit in very close proximity to the world’s most famous mother-in-law. And what a nice house it is! Enter the estate through those massive (and secure) iron gates and head straight through an immaculately manicured driveway to a circular motor court with an elegant fountain. 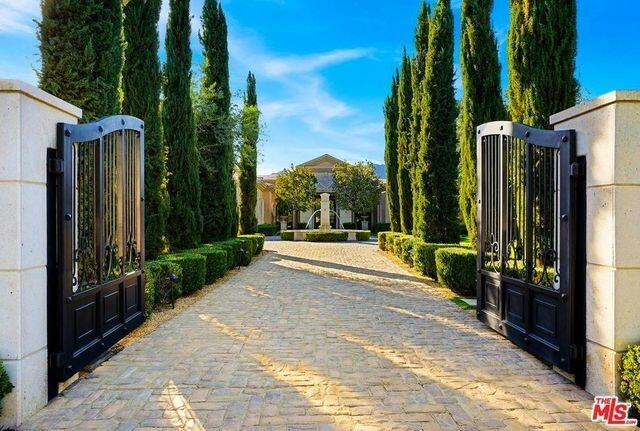 The front gate and driveway that lead to Kimye’s rumored Palm Springs–area purchase. The palatial spread is a gorgeous French contemporary villa with elaborate landscaping, formal gardens, and a lavish pool. 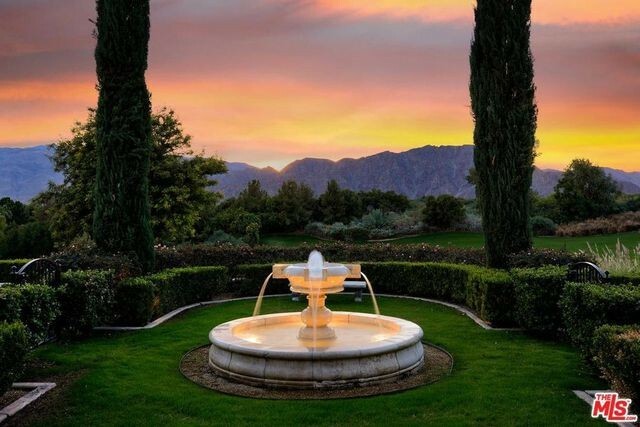 You’d hardly know you’re in the middle of the desert, for all the lush lawns and water features on the property. One of the first things you note when you enter the mansion itself is its sweeping views of the pristine backyard, the swanky golf course beyond, and the often snow-capped mountains, all visible through disappearing floor-to-ceiling glass doors. In 8,728 square feet of space, there are six bedrooms, five baths, and two half-baths, almost all of them with windows that focus on those views. Other fab features include an elegant home theater, a master suite with substantial closet space and a private office, plus a separate guesthouse with its own private garden and spa. You can never have enough accommodations for members of the entourage that it doubtless takes to make Kimye, well, Kimye. 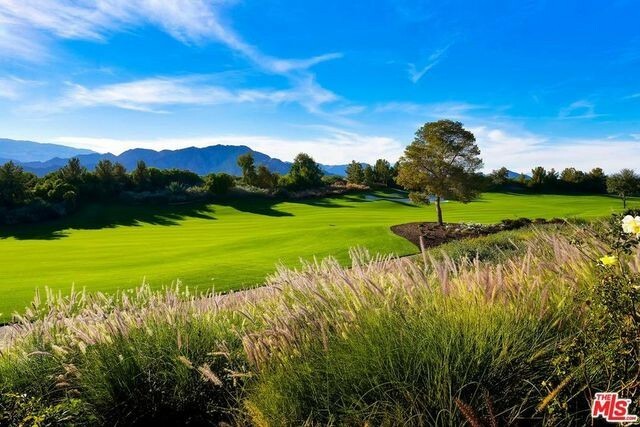 Both Jenner’s home and the speculated Kimye property back right up to the Tom Fazio–designed, world-class golf course, inside the extremely exclusive Madison Club. Perhaps all the better for West to brush up on his game (if, in fact, he has one) so he can more productively hobnob with his golf-loving political connections. The home backs up onto one of the world’s most exclusive golf courses. We guess the only question now is when the Kardashian clan gathers together in La Quinta, whose house will they pick?